Byodoin Phoenix Hall, built in the 11th century during the Heian period of Japan. 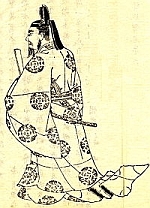 Drawing of Fujiwara Michinaga, by Kikuchi Yōsai. Lord Sugawara Akitada, senior secretary in the Minstry of Justice, cannot forget the promise to his friend Haseo. Condemned to die for a crime he swears he did not commit, Haeso has left few clues behind to help Akitada's hunt for answers. Although his sword remains, Akitada must first uncover the very details of the charged crime, including the victim. All records have been wiped away just as the family name of convicts are erased. Meanwhile, Akitada's retainer, Toro, investigates the the murder of Tomoe, a blind singer. As the two seek to uncover the truth, smallpox disrupts the city's normal patterns as residents flee and others seek to protect themselves. Set in 11th century Japan, THE CONVICT'S SWORD gives an authentic look into the history of the period without sacrificing the mystery to the historical details. THE CONVICT'S SWORD is a delight for mystery lovers like myself who crave challenging complex mystery puzzles over the more linear mysteries peppered with a few red herrings. Indeed, the historical details and the mystery itself combine in equal measure to make THE CONVICT'S SWORD a thrilling adventure for fans of both genres. The mysterious lack of details sets the stage for an exciting mystery while Akitada's reasoning and examination of clues creates a mystery that leads him deeper and deeper into the setting and characters related to the mysteries. Alongside the main storyline, I.J. Parker creates subplots, such as the events and troubled relationships in his workplace and family, that create a rich depth of characterization. The characters are never static but their ongoing relationships change and deepen throughout the story as the events challenge them in new ways. Sixth in the Sugawara Akitada mysteries, not including the short stories, THE CONVICT'S SWORD works as a stand alone for newcomers to the series, like myself, although in finishing this novel, I am eager to explore I.J. Parker's earlier mysteries and anxiously await any future releases as well. The mystery is not bogged down with a retelling of past cases nor does a reader feel a lack of information coming to the series fresh thanks to the richness of the author's characterization. Likewise, a reader need not be a scholar of Japanese history to enjoy this mystery. While the novel is packed full of historical detail, the author's style is not antiquated nor do the characters feel remote and detached. The historical details are never superfluous but rather are exquitely integrated into the characterization and hunt for clues. I.J. PARKER gives the reader a look into the Heian age and the dynamics within the city and its residents as the case takes both Akitada and Toma to look for clues in various groups of residents. THE CONVICT'S SWORD has a wonderful mixture of action, a more intellectual fine analysis of records, and the rich relationships within society and between individuals.